Somehow she had to buy clothes. Clothes that would do for Speech Day (the poshest of the posh but nothing anyone would notice) and Oxford (‘Do make an effort, Clarry!’. She had… one pound and sixpence. Enough to make a start. … Here was a haberdasher’s, and there, by great good luck was a box on the floor full of lace stockings -cream, white and black – all jumbled together and smelling rather musty. BARGAINS! – read the label on the box. They found a deep raspberry-pink velvet beret that Clarry thought was the most beautiful hat she’d ever seen. It fitted her perfectly. ‘Look at that dress!’ It was grey, striped with cream, and had a cream muslin bodice laced with grey. ‘Do you think they’ll let me try it on?’ The grey dress fitted her perfectly. Well of course I did. I’m Hilary McKay’s biggest fan, and was writing about her here recently, coincidentally: I had decided that her Saffy’s Angel is the best book to give a convalescent – read all about it here, and other people’s suggestions here. The Skylark War is her newest book, just out, and it is astonishing. It is complicated, and funny, and sad, and it sticks in your mind after you’ve finished it. It combines everything: childhood games, strange families, important friendships, hideous schools. Then: young men in the trenches, women at home, life carrying on, the small things that mattered still even in wartime, and the big things that you know are going to come. And Clarry trying to get herself an education. It is beautifully done, and must have been an incredibly hard tightrope to walk for the writer, because you can’t pretend there won’t be death and destruction, and that surely some of the characters are not going to have good endings. And the book is not horrible, but it is not at all soft-centred. There is nothing harsh, but it’s all there if you look, in McKay’s lovely relaxed writing. Consider this. Clarry and her new friend Violet have been discussing writing to soldiers – Violet is looking for romance. She knows Clarry writes to a young man, her cousin, and Clarry says they aren’t love letters. A while later Violet asks to see a picture of Rupert. He shouldn’t have gone. He needn’t have. What use would Simon be with a gun? He used to walk round ants, he was so kind. It isn’t fair. Mrs Morgan says if anything happens to him, it’s for the best. She says life isn’t easy for boys like him. I’m never speaking to her again. I could keep going with quotes, but really I just urge you to read this book. I have read many novels and other books about WW1, all the standards and all the classics, and this is one of the very best that I have ever read, along with Ford Madox Ford’s Parade’s End (which is a work of genius, too, but is a lot longer and not nearly so easy to read). And actually, I would rather read this again than any of the books on the Booker Prize shortlist. Will set me off. Again. Along with the spare key to the cricket pavilion on a leather bootlace. But Skylark is also funny and charming, and just a delight beyond all imagining. Clarry rather feared this too. 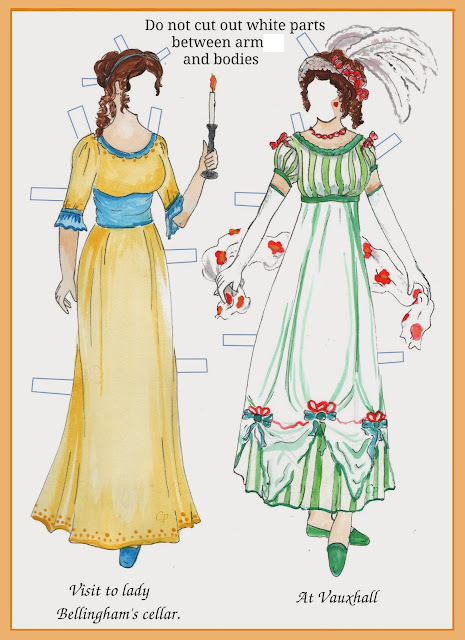 Small picture from same source shows dresses for ‘the betwixt and between girl’ – an early idea of teenagers. I couldn’t find a velvet beret picture that I considered good enough for Clarry, but I loved those three young women in their nice hats – many of the other hat images I found were of rather older, stately women. This picture was much the best, I like to think of them as Clarry, Violet and Vanessa. Also from NYPL. Oh gosh and goodness, what a perfect review and that is so much Vanessa, Clarry and Violet in their hats. The pictures you have found are wonderful. I searched everywhere for Clarry's pink velvet beret, but couldn't quite find it. All through the book, as I wrote it, I was aware that one day you might read it. So I worked extra hard on the clothes!!! So glad you liked the review - nearly as much as I loved the book! and yes, was so pleased with that picture. And am very proud of the idea that I keep you on your toes writing proper clothes descriptions. Well - the weather might well have changed again by tomorrow? Both outfits sound splendid. I think you should be like Marie Kondo (the de-clutter queen, whom I revere despite the fact that reading her book didn't seem to actually solve my mess problems). When you are getting dressed put your hand on each of the outfits in turn, and say to yourself 'Does this dress inspire joy?' One of them will feel more joyful than the other, so you wear that one. And in my sane moments I can spell "delightful". But I tend to get carried away and to be a wee bit too trigger happy. We all make those mistakes Birgitta - such a pain we can't edit! and yes, dresses and tea are the happy parts of life. I'm so glad you liked this one as well as you did, Moira. Of course there are the clothes, but it also does sound like an effective look at the era. But I think, for me, it's also that writing style. I can see why it drew you in the way it did. Thanks Margot, and yes, you just know when you are in the presence of good writing! But do bear this one in mind. I just ordered a copy a copy of this one tonight. Looking forward to it. I hope you love it as much as I did. I keep thinking about it, which is always a good sign. You have picked out so much of what I loved about this book. Glad you enjoyed it, but one where our tastes diverge. Yes - it is a truly great book, but probably not your cup of tea.